Now That The Government Has Shut Down, Here's What Actually "Shuts Down"
It's official: as of midnight Saturday, the US government has shut down following a failure in the Senate to strike a funding deal. Government funding was due to run out after Dec. 8 but was twice extended, most recently through Jan. 19, at which point the US encountered what’s officially called a "spending gap," which triggers an official halt to Washington’s work. In retrospect, this is hardly a novel development, as history shows there have been 18 previous closures starting in 1976, with the last one taking place in September 2013. Almost all of the funding gaps occurred between FY1977 and FY1995. During this 19-fiscal-year period, 15 funding gaps occurred. Additionally, seven of the funding gaps commenced with the beginning of the fiscal year on October 1. The remaining 11 funding gaps occurred at least more than one day after the fiscal year had begun. Ten of the funding gaps ended in October, four ended in November, three ended in December, and one ended in January. 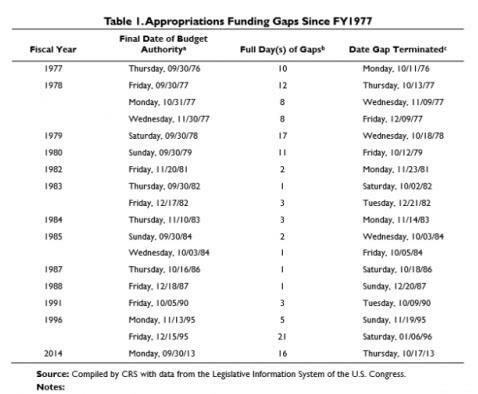 According to the CRO, funding gaps have ranged in duration from one to 21 full days, with six of the eight lengthiest funding gaps, lasting between eight days and 17 days, occurred between FY1977 and FY1980—before the Civiletti opinions were issued in 1980 and early 1981. After the issuance of these opinions, the duration of funding gaps in general shortened considerably, typically ranging from one day to three days. Of these, most occurred over a weekend. 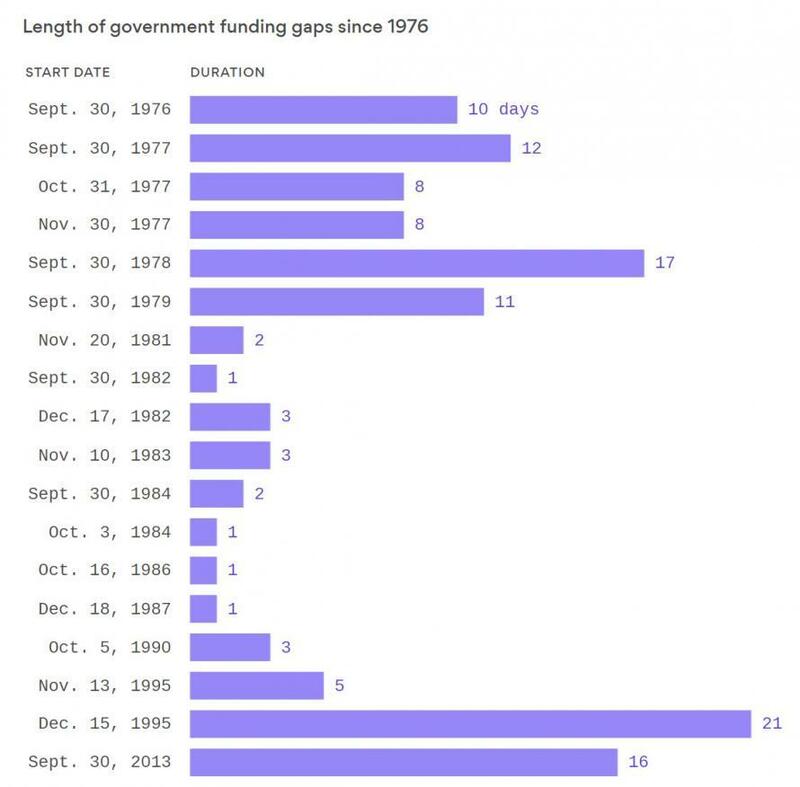 So now that the US government is taking some time off for only the second time this century, here is a summary of what actually is shut down until the funding gap is closed, courtesy of Bloomberg. 1. What happens if the government shuts down? Many, though not all, federal government functions are frozen, and many, though not all, federal employees are furloughed. Agencies in the executive branch, the one with the largest workforce and budget, regularly review shutdown plans that spell out what work must continue, and how many employees will be retained, during a "short" lapse (one to five days) and one that lasts longer. 2. Which government functions cease? The ones that draw headlines are closures of national parks, monuments and the Smithsonian museums in Washington. Other activities that may stop if the shutdown lasts more than a few days include the processing of applications for passports and visas; new enrollments in experimental treatments under the National Institutes for Health; and the maintenance of U.S. government websites, including ones used by businesses and researchers. Mortgage approvals can be delayed by furloughs at the Internal Revenue Service and the Federal Housing Administration. The last shutdown, which lasted 16 days in 2013, delayed release of Labor Department monthly employment reports, Commerce Department data on retail sales and housing starts and a monthly Fed report on industrial production that uses Labor Department data. Also delayed was approval of drilling applications at the Bureau of Land Management, consideration of applications for small business loans and the start of the Alaska crab season, which relies on harvest levels apportioned by the National Oceanic and Atmospheric Administration. The Treasury Department, which includes the IRS, will send home more than 83 percent of its 88,268 workers. About 1,000 employees will stay in place to manage debt, monitor domestic and international financial markets and policy coordination. Another 2,800 workers are exempt from the shutdown to avoid any disruptions with debt borrowing functions, debt collection, investment, debt accounting and Social Security disbursements. At the IRS, tax refunds could take longer, depending how long the shutdown lasts. The agency lists work related to issuing refunds among tasks that won’t be excepted from the shutdown. But it wasn’t expecting to begin accepting 2017 tax returns until Jan. 29. The Executive Office of the President will be dramatically pared down, according to a memo released on Friday night. The memo called for reducing the total number of workers in the office to 659, out of about 1,715 people on staff. The White House Office, a subset of the executive office that includes many of the functions closest to the president’s decision making, will be cut from 371 staffers to just 152. Twenty-one people will remain at the Executive Residence, as well as one person at the vice president’s residence. Fourteen staffers will be working at the Office of the Vice President, from 16. The National Security Council will retain all but one of its 45 staffers. Eight people will remain at the Council of Economic Advisers, from 24. Operations at the Securities and Exchange Commission are set to be sharply curtailed. Despite collecting fees from participants in the markets it regulates, Wall Street’s main regulator will shrink its staff to about 300 employees from almost 4,600, according to an agency plan posted in December. The SEC plans to keep operating its Edgar corporate-filing system. But it won’t approve registrations for investment advisers, issue interpretive guidance, or review many pending applications or registrations for new financial products. The commission will continue to deal with emergency enforcement actions like temporary restraining orders against accused market cheats. And it will continue to monitor its system for tips, complaints and referrals and operate its information systems, according to the plan. At the country’s main swaps regulator, the vast majority of activity will likewise grind to a halt. Under a plan submitted to the White House on Friday, just 69 essential employees will remain on the job to try to ensure “to the extent practicable, the oversight of the derivatives markets and to police those markets to ensure they are free of fraud and manipulation." Still, the “vast bulk” of work by the commission will cease, according to the plan. For example, the agency’s enforcement division will stop reviewing and investigating new victim complaints, or taking new actions against violators. Much market oversight activities will also cease. The shutdown is likely to postpone the release of market-moving economic data, depending how long it continues. In 2013, the Labor Department’s monthly employment report for September was delayed by 18 days, while the release of October figures was pushed back a week. Department of Commerce data were also delayed, including retail sales and housing starts, along with industrial-production figures from the Federal Reserve. The Department of Agriculture’s National Agricultural Statistics Service, which publishes data important to livestock and crop traders, won’t be releasing any reports on any day the government is shut down, according to department spokesman Damon Thompson. 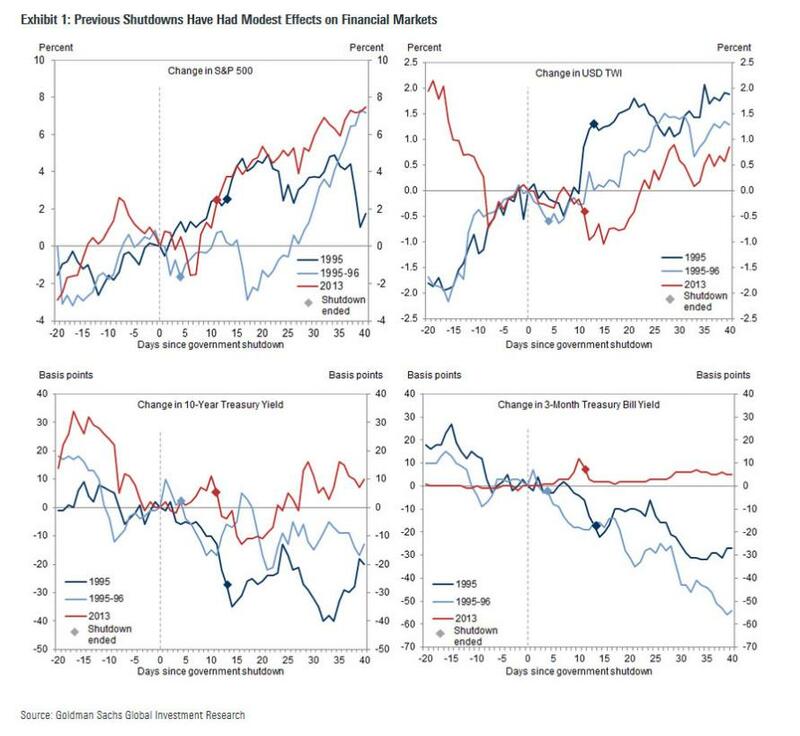 For the central bank’s functions that aren’t related to economic data, it’s likely to be business as usual, since the Fed doesn’t rely on money appropriated by Congress to operate. That means checks will still be cleared and FedWire, used by the financial industry for large, time-sensitive credit payments, will continue to run. The U.S. Patent and Trademark Office, which relies on user fees and doesn’t get tax dollars, said it has enough money to remain open “for a few weeks” to process the hundreds of thousands of applications for patents on new inventions or trademarks for new products. The Federal Communications Commission has funds to remain open through Jan. 26, spokesman Brian Hart said in an email. During the 2013 shutdown, the agency stopped accepting filings and ceased certifying that new electronic devices don’t cause interference. Farm Service Agency offices in rural counties nationwide will be closed, and federal farm payments won’t be processed, according to the Agriculture Department. Many programs at the Department of Labor designed to help workers will stop. Other federal offices designed to protect workers’ rights will also close their doors. The Office of Federal Contract Compliance Programs, which enforces contractors’ compliance with labor and civil rights laws, will cease operations. The Trade Adjustment Assistance Program will stop processing new requests for assistance from workers who’ve lost their jobs to competition or offshoring. The National Labor Relations Board will stop handling cases. The Equal Employment Opportunity Commission, which enforces workplace civil rights laws, will cease investigating charges and answering questions from the public. The Occupational Safety and Health Administration will send home three-quarters of its staff, and suspend most workplace safety inspections. Some exceptions will be made, such as investigating "imminent danger situations," addressing first responders’ warnings of "high risk of death" and following up on "high-gravity serious violations." The law exempts from the shutdown those employees who are deemed necessary to protect life or property. Most types of law enforcement and criminal justice fit into that category. About 83 percent of the Justice Department’s 115,000 employees will continue to report to work if the government shuts down, according to the department’s contingency plan. Criminal litigation will continue without interruption; non-essential civil litigation is to be curtailed or postponed. The Federal Trade Commission will suspend antitrust investigations not related to mergers. Merger reviews by the FTC and the Justice Department will continue. The agencies say they will go to court to challenge deals if necessary. Federal courts, including the Supreme Court, have enough money from sources like fines and filing fees to continue most operations through Feb. 9, according to Jackie Koszczuk, a spokeswoman with the Administrative Office of the Courts. At the Defense Department, military personnel are expected to report for duty, but won’t get paid until the shutdown ends. As for civilian workers, those performing activities excepted from the shutdown, such as protecting property or lives or supporting combat operations, will likewise have to work; the rest can stay home. That doesn’t mean the department isn’t affected. A shutdown can mean halting maintenance of weapons and other defense systems. Payments also stop for a range of services, including everything from money to contractors to death benefits for families of those killed in the line of duty. Another casualty of a shutdown: at military bases around the country, so-called commissaries -- what civilians might call grocery stores -- will shut down, a complication for families at remote locations, according to Rebecca Grant, a military analyst and president of IRIS Independent Research in Washington. The effects of a shutdown on foreign and trade policy may be minimal. The State Department says no new travel or "representational events” should be arranged. However, Secretary of State Rex Tillerson hasn’t decided yet on whether to cancel a trip to Europe planned for next week. About half the staff at the Department of Health and Human Services will be furloughed, according to a plan posted on the department’s website Friday. The resulting changes will reverberate across a range of functions that affect the average person. The Food and Drug Administration will be "unable to support the majority of its food safety, nutrition, and cosmetics activities," according to the shutdown plan. It will also stop conducting "routine establishment inspections, some compliance and enforcement activities, monitoring of imports" and other programs. The Centers for Disease Control said its "immediate response to urgent disease outbreaks, including seasonal influenza, would continue." It added that it would be "unable to support most non-communicable disease prevention programs." The National Institutes of Health, which typically treats only those people for whom standard treatments don’t work, will stop admitting most new patients. Food-safety inspections and other critical functions will continue at the Department of Agriculture. Federally mandated nutrition programs, such as the Supplemental Nutrition Assistance Program and school-feeding initiatives, will continue, but the Women, Infants and Children program and other assistance from the discretionary budget may be in danger of running out of funds. 3. Which government functions continue? Activities related to national security (like the military services), safety and order (air traffic control, law enforcement) and medical care (veterans’ hospitals) are among the essential activities that carry on. So does the U.S. mail, since the Postal Service has its own funding stream. U.S. Treasury debt auctions continue, Social Security and Medicare checks get mailed, food stamps are distributed. Federal courts are open but their work is subject to disruption. 4. How many federal employees stay home? In the 2013 shutdown, the number of executive-branch employees who were furloughed on a given day peaked at 850,000, or about 40 percent of the workforce. 5. Do federal employees get paid? Eventually. When a shutdown happens, most federal employees -- there are about 2.8 million of them now -- are placed on unpaid furlough. Though there "appears to be no guarantee" that they will eventually be paid, in practice they always have been, retroactively, via legislation passed by Congress, according to the Congressional Research Service. 6. How often does this happen? There have been 12 shutdowns since 1981, ranging in duration from a single day to 21 days, according to the Congressional Research Service. The 21-day one, in December 1995 and January 1996, was a famous budget showdown that pitted President Bill Clinton, a Democrat, and the Republican House speaker, Newt Gingrich. Shutdowns over budget disagreements are different (and less grave) than what would happen if the U.S. breached its debt ceiling and defaulted on some of its obligations. That’s never happened -- though its specter, too, will grow if Congress doesn’t reach a budget deal in the next several weeks. 7. What happened prior to 1981? Until then, "funding gaps" didn’t result in shutdowns; agencies operated mostly as normal, and their expenses were covered retroactively once a deal was reached. Benjamin Civiletti, attorney general under President Jimmy Carter, put an end to that. With legal opinions issued in 1980 and 1981, he established that government work generally must cease until Congress agrees to pay for it. His rulings were codified in the Antideficiency Act, which, in theory at least, authorizes fines or prison terms to federal employees who dare work for free during a shutdown. Markets have tended to shrug off shutdowns as long as the debt limit is not involved. The 1995, 1995-96, and 2013 government shutdowns had a modest effect on financial markets. The dollar weakened slightly in all three cases in the few days following each shutdown, with a further leg down in 2013 as the debt limit deadline approached. Treasury yields did not react meaningfully at the start of these shutdowns. The equity market reaction was inconsistent, with a slight decline in the early days of the December 1995 and October 2013 episodes, but no real change around the November 1995 shutdowns. This time around, the debt limit deadline is around six weeks away from the Treasury’s target, and even farther from our own estimate, so unless the shutdown lasts for over a month, the market should largely ignore it.